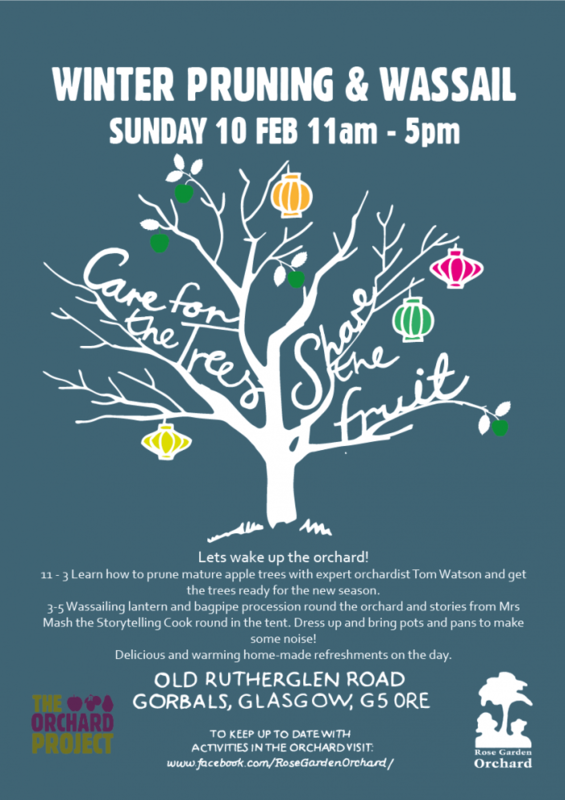 Orchard Wassail [and pruning] Sun 10th Feb .
You will be learning from orchardist Tom Watson of Leith Community Croft in Edinburgh, who has years of experience in horticulture and has a particular interest in fruit trees. He runs a social enterprise tree nursery at the croft. He will explain the basic principles of pruning and get you confidently making cuts in no time. The Orchard Project’s Fergus Walker will also be on hand to help and advise. Lunch and hot drinks will be provided. There is a container to shelter in at break time but dress for standing out in wintery weather. Getting to the orchard is fairly straightforward. It is 10 min walk from Bridge Street Subway station, or you can get a train to Glasgow Central Station and it is 15min walk. Book tickets for the pruning here. Stay at the end of the workshop for a Wassailing of the trees and drink their health for the coming season with mulled apple juice! Wassailing lantern and bagpipe procession round the orchard and storytelling from Mrs Mash the Storytelling Cook. Bring pots and pans to bang together as we process round the orchard!